I?ve been busy this week preparing for Thanksgiving, cleaning and organizing in anticipation of a house filled with guests. I started to daydream about my amazing trip to France in September and the enchanting hilltop towns. My trip took me there in early autumn it was still warm. 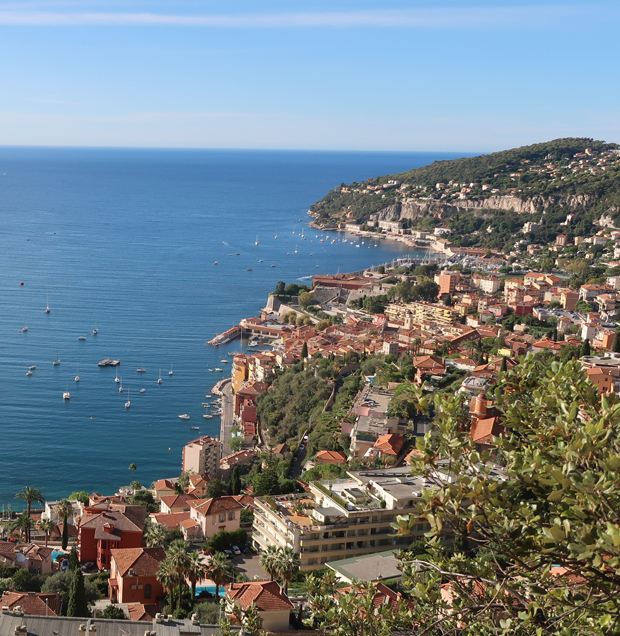 I stayed in Nice for a few days and from there adventured out on a few day trips, two of them being visits to hilltop towns that many of you recommended. Èze was my first stop (on the road to Monaco) and wow what an incredible view you?ll see on the road there. I was on a small group tour and we stopped here just to take it all in. Èze as foretold by so many was absolutely charming. It had a beautiful church and the most magnificent Mediterranean sea views from a botanical garden on top. Everywhere you turn there are vines growing on top of centuries old walls, it?s so charming. I couldn?t help but hum that song from Beauty and the Beast, ?Little town, it?s a quiet village, every day, like the one before ??. One of the benefits from traveling alone on this trip was that I could take my time as I walked the twisted streets, grabbing a coffee, popping into a shop, ducking down alleys, stopping along the way to take pictures or video. In Èze, I loved the color of the church in the middle of the town, its hue just a hint more yellow than my house back home in California.